In our family, eating legumes has always been a way of life - a nourishing experience of bright flavors, diverse textures, and soulful stories. Our passion is to share our Legume Bowls inspired by a North American palette of fresh, simple, and sustainable. Our distinctive green chickpeas produced in the USA actually leave the soil healthier than it was found! We source our sustainable ingredients where available and use sustainable methods in our production and pouch, making our products safe and clean, giving back to the Earth every step of the way. We combine these highest quality ingredients to bring you the most delicious and versatile creations in a convenient built-in bowl. Vana... every day! 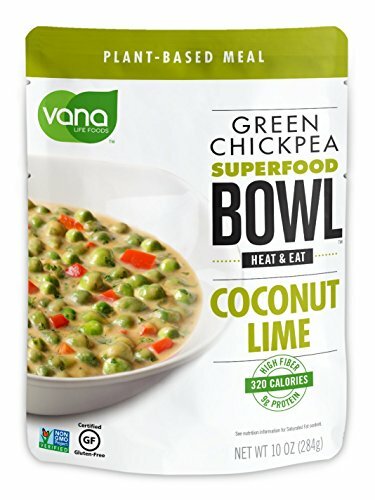 Vegan ,Vegetarian, Soy Free Gluten Free--Plant Based Meal with an IN-BUILT BOWL. Just Heat and Eat.No need to add water. Green chickpeas is the next SUPERFOOD. These are high in Fiber, Folate, Boosts Immunity,. 320 calories with 10 grams of PROTEIN, Good source of IRON, FOLATES and essential Vitamins and Minerals. This Product is perfect for Mommy's with young kids, Camping, Picnic, College students, Lunch meal when you don't have time to cook. Just add this product to rice, Quinoa or wraps. Naturally occurring salts derived from Tomatoes and Potatoes, Coconut milk. We barely added salt on top. If you have any questions about this product by Vana Life Foods, contact us by completing and submitting the form below. If you are looking for a specif part number, please include it with your message.